I spent my Thursday night in a packed house. And I don’t mean I sat in the 99-seat student theatre with people on either side, I mean I got to the 500-seat auditorium an hour early and had to fight for my prime vantage point. The production played to a competitively sold-out crowd for 3 straight shows, and it’s not hard to figure out why. 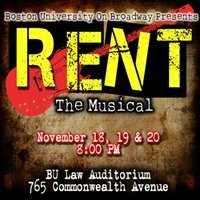 BU on Broadway did RENT this past weekend. RENT!. Arguably the most popular musical of the past 20 years, especially with the college demographic. It’s not the most musically sophisticated show, nor is it very cleverly plotted, but RENT is one of the most emotionally evocative things there is to see and that’s what OB really got across this weekend. The whole production was a mixed bag of good and bad, and while I can’t resist my need to nitpick the bad, it’s important to remember that the good was great. Like the show itself, this production suffered under issues of technique at times, but it’s emotional truths made none of that matter. When I left the theatre the only thing in my mind was that triumphant finale mantra of “no day but today” and the enveloping rock beats laid down by the capable pit (led by the always-genius Jonathan Brenner). The only reason I remember how badly the sound board was run, how over-choreographed it was at times or how clunky the blackout/set-changes were is that I took notes for this review. Despite all its flaws, this was still RENT, 2 hours worth spending, no matter what. However, the clout of the show name comes with some extra hurdles for the cast, none bigger than the shadow of the original actors. RENTheads do love the show relatively unconditionally, but they also know the original performances inside and out. Such a personal piece is intrinsically tied to the people who it was created on, (especially since Jonathan Larson, the composer, died before opening night and therefore never worked with a second cast). There will never be a “One Song Glory” that won’t be compared to the definitive performances given by Adam Pascal, the original Roger. No Mark will ever escape the shadow of Anthony Rapp and the gigantic shoes of Broadway’s power couple Idina Menzel and Taye Diggs will always be hard for any Maureen or Benny to walk in. That’s to say nothing of the legacies of Jesse L Martin and Wilson Jermaine Heredia, the incomparable performers who first gave life to Collins and Angel, the most elusively wonderful characters in the show in my opinion. The weight of RENT‘s history is heavy on any new cast, especially one made up of students who grew up with those very voices in their headphones. But OB’s cast gave it everything they had, with varying degrees of success. Rachel Hawkes had the toughest time. Her Mimi was red-hot in the arms of Rylan Vachon’s emotional Roger, but fizzled a bit when left on her own. Aesthetically she worked, but was hit-or-miss when it came to her grittier blocking and though Hawkes sold the character for the most part, she was vocally outmatched by the role. Actually, that full belting chorus was brilliant, or mostly brilliant, or always brilliant but sometimes misused. Basically, they nailed “La Vie Boheme”, and “Seasons of Love” was beautiful (kudos to brilliant soloist Nicole Sorice on this one). But there’s a reason “Life Support” and “Will I” aren’t written with full chorus, it’s too much. Poor little Gordon is singing his sweet poignant solo and then, instead of a soft chorus of 8 voices, he’s greeted with a thundering surge of 20 powerhouses “supporting” him. I, frankly, would have been scared and found another support group. But sometimes, powerhouse was exactly what this production ordered, and Maureen and Joanne, naturally, obliged. Abigail Smith was a bit of an over-actor as Joanne but her vocals were through the roof so she gets a bit of a free pass. On the other hand, evermore-ingenue Sarah Jill Bashein was so much better theatrically and vocally as Maureen than I’ve ever seen her be. The friend sitting next to me (very picky about her Maureen) literally leaned over after “Over the Moon” and whispered “thank god” Bashein was so good. The tiny, smiley pro seemed set free in the much more daring role. She embraced the raunchy, showy, narcissistic fun of the character with great verve and hollered after her high notes with the audacity of someone singing when no one could hear. “Take Me or Leave Me” was truly a song for starved ears. Also wonderful was Alex Warren’s Benny. Oftentimes the throwaway character of the show, OB’s Benny was actually one of my favourites. Warren proved a beautiful singer and an empathetic performer, aptly turning the sometimes villainous Benny into someone I always wanted on the stage. As for that final couple, my make-it-or-break-it favourite characters, they made it just fine. Bernardo Vargas was a beautiful Angel: sweet and endearing and cute as a button. Perhaps slightly lower heels would have allowed him more comfortable movement (they were seriously high!) but Vargas brought the group’s heart to life with great clarity. But it was freshman Carl Welch who truly won my love (though it’s not as if Collins doesn’t do that no matter what). An impressive vocalist, Welch understandably worked with a slightly adapted score, modifying some of Jesse L Martin’s superhuman notes, but he still shone as a standout singer. Warm, fun and charming-as-hell, Welch maneuvered the tricky line of playing an extraordinarily intelligent character as sublimely down to earth, well, extraordinarily. With intelligent direction by Chris Behmke, perfect lighting design, great costumes, an excellent Brenner-headed pit and fun choreography from Leni Zneimer (“Contact”, especially, was very good), RENT overcame anything and everything weighing it down and ultimately touched the whole packed house the way RENT is meant to. *This article has been edited to exclude a positive mention of a performer who wishes to not appear on the website.